Rubber Lined Vessels, Tanks, Piping etc. The process of rubber lining is divided in to the following steps. Preparation of the base surface. Application of the rubber sheets on the metal surface. This is very important process for rubber lining. The surface of the METAL MUST BE FREE FROM OIL, PAINT, SCALES, RUST ETC. THIS IS GENERALLY REMOVED WITH THE HELP sand blasting/ shot blasting. After the surface is cleaned, adhesive or bonding agent is applied to surface. Two or three coats are applied, as adhesion is an important process for rubber lining. The rubber compound is manufactured as per the requirements after looking in to the chemical and other conditions of the process. Rubber sheets are made on calendar machine in different plies. Lining up to 6 mm thickness can be applied in single layer. If the thickness is more, it is applied in 2 or more layers. 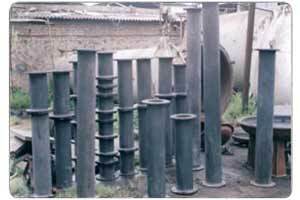 For Pipes & fittings Extruded rubber tubes are inserted in the Pipes. Un vulcanized rubber sheets, which are prepared on the machine are applied on to the adhesive coated, half dried surface under slight pressure of hand or with a metallic roll as well as with the help of various lining tools. We have to ensure that no air gets trapped between the metal surface and rubber sheet. Joints are made levels and joind with help of knurling tools. By and large vulcanization is carried out in an auto clave. This is the process by which rubber changes from plastic state to elastic state. The temperature and pressure depend upon the rubber compound and thickness of lining. Large size equipments, which are rubber lined at site, are vulcanized BY OPEN STEAM AS WELL AS BY HOT WATER CURING, THE TEMPERATURE IS MAINTAINED TO GET THE RUBBER CURED AND FOR THIS METHOD SPECIAL COMPOUND OF RUBBER IS TO BE MANUFACTURED FOR THIS PROCESS. All the rubber-lined items must be tested before and after vulcanization. This is to ensure that they are free from faults, Which might cause failure of the equipment. Visual inspection in good light is carried out to check mechanical damages blisters and poor joints. There after spark test with a high voltage is carried out to check mechanical damages, pin holes, blisters and poor joints. Hardness test is MUST for rubber lining. Knocking test is also carried out by an experienced hand with the help of Wooden hammer to check whether there is any poor bonding. The vessel should be stored away from sunlight or it should BE covered by tarpaulin or some, other device. This will avoid direct sunlight, which may affect the surface due to the presence of ozone. The vessel should be filled up with water when not in use for longer period. Manufacturers & Suppliers Of Proven, Reliable And High Quality Spares for D M Plants & Water Treatment Plants.